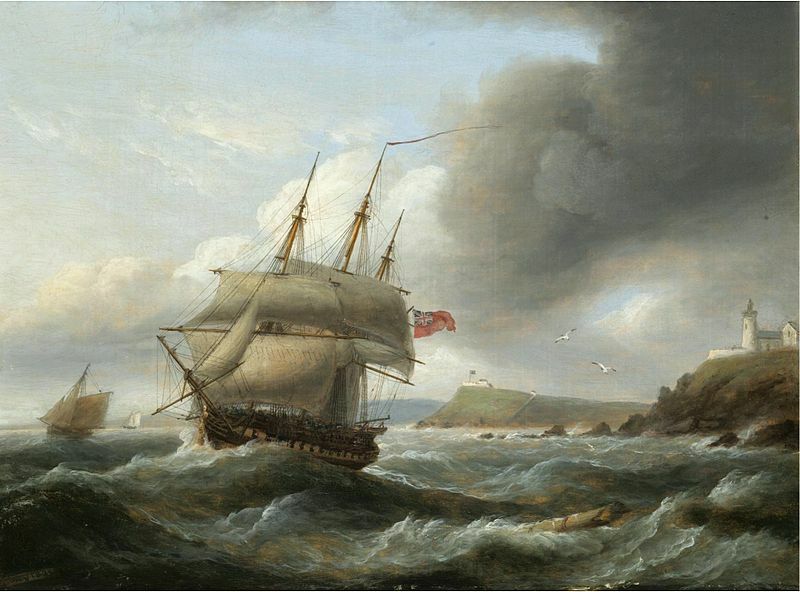 Luny was born in Cornwall – most appropriately in the famed “Year of Victories” when British forces were triumphant on land and sea In Europe and North America. 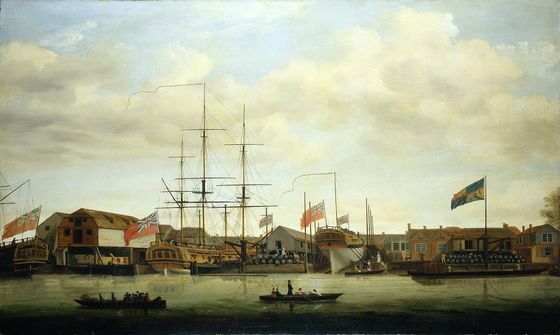 He came to London at the age of eleven and was apprenticed to the marine painter Francis Holman (1729–1784), who was himself son of a master mariner. 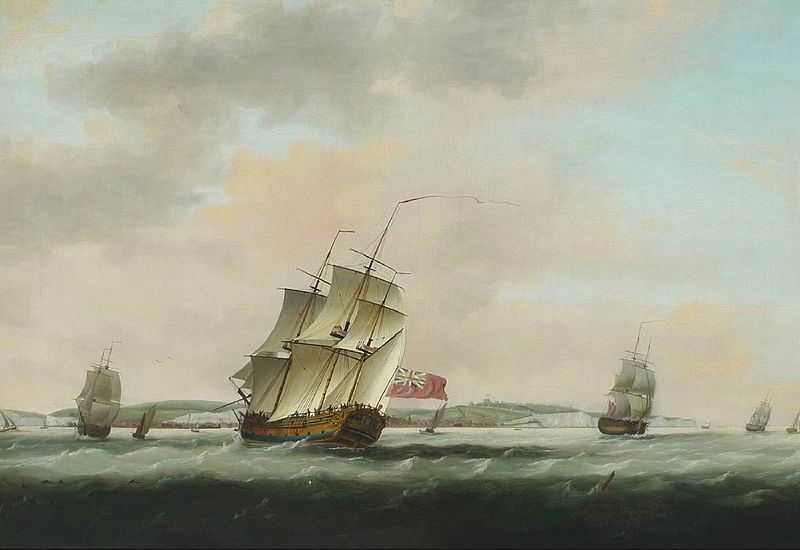 This apprenticeship proved significant in determining the course of Luny’s career since Holman’s younger brother, Captain John Holman (1733–1816), maintained the family shipping business. The relationship between the brothers appears to have been a close one. Francis would therefore have been in close contact with the maritime world and this showed in the wealth of detail and accuracy in his later work. Talented as Holman was however, it is partly because of his mentorship of the more illustrious Luny that he is now most remembered. 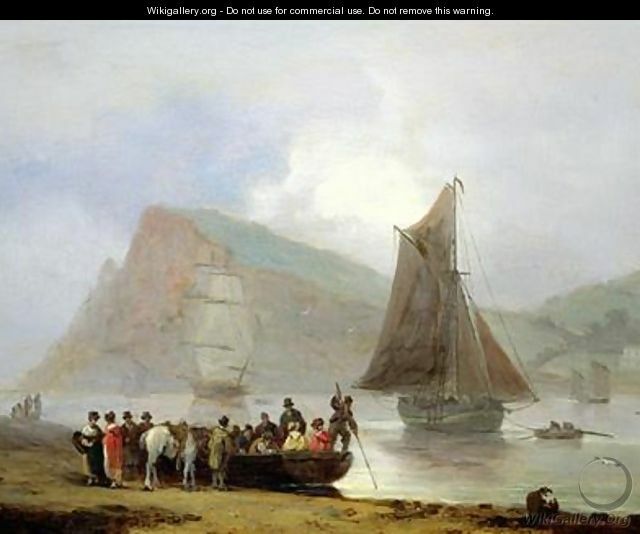 By 1780 Thomas Luny had shown sufficient talent that he was exhibiting marine paintings in the Royal Academy, and indeed he continued to do so up to 1802. 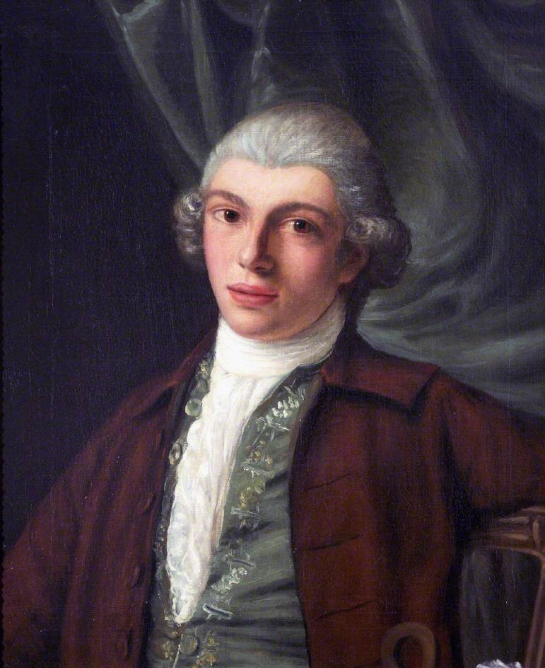 From 1783 Luny lived in London’s Leadenhall Street, and here became acquainted with a dealer and framer of paintings called Merle who subsequently promoted Luny’s work very successfully. Thomas Luny’s home address in Leadenhall Street was also significant in that it was where the British East India Company had its headquarters. It was from “John Company” that Luny was to receive many commissions for paintings and portraits. This relationship had non-monetary benefits also for, on occasions, Thomas Luny seems to have been invited as a guest on Company ships on special occasions and voyages. This probably accounts for the great detail and realistic look of many of his sketches of locations such as Naples, Gibraltar, and Charleston, South Carolina. 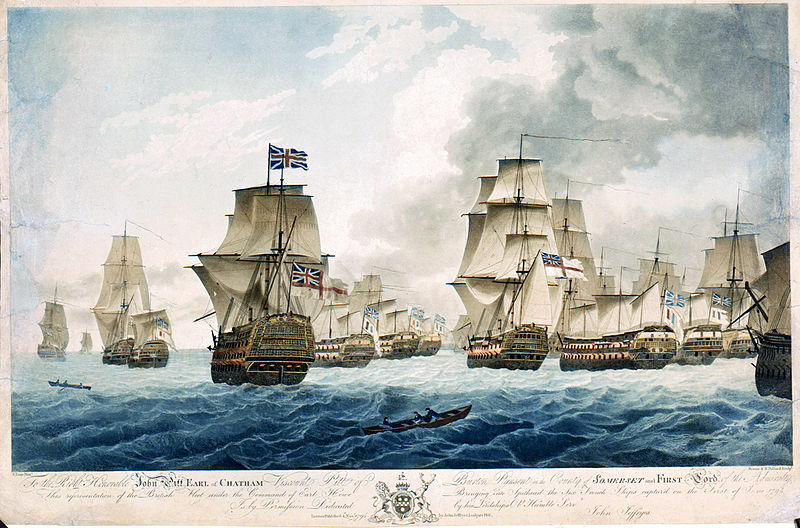 Between 1793 and 1800 Thomas Luny appears to have gone to sea with a purser’s warrant and served with Captain, afterwards Admiral, George Tobin (1768–1838). One suspects that under Captain Tobin the purser’s duties may have been nominal – a legal fiction for getting Luny to sea. One has the distinct impression that the relationship between Luny and Tobin was very similar to the fictional one between Jack Aubrey and Stephen Maturin, two men of very different characters and aptitudes who nevertheless valued their friendship dearly. One would like to think so. 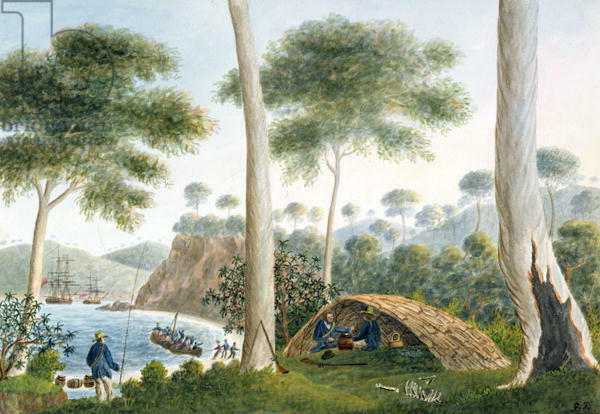 Tobin was himself an artist and the watercolours he made when he sailed with Captain Bligh to Van Diemen’s Land in 1790-1792 are in the Mitchell Library, Sydney (see example above). In this, once again, one sees the Aubrey-Maturin similarity, since in both cases the dissimilar personalities have one shared passion and talent, in the once case for music and in the other for art. 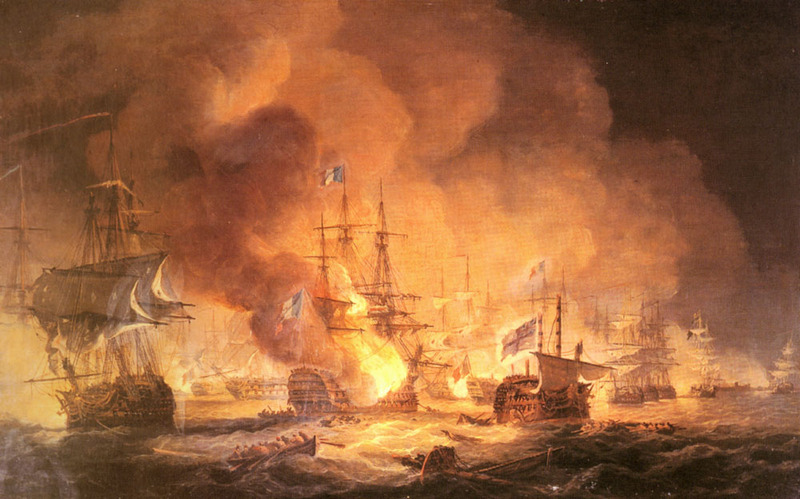 Whether Thomas Luny was present at the battle of the ” Glorious First of June” is uncertain, but he painted, among many other marine subjects, several of the incidents of this battle and of the subsequent bringing home of the prizes. It is equally uncertain whether he was on hand for the Battle of the Nile 1798, which he also illustrated spectacularly. 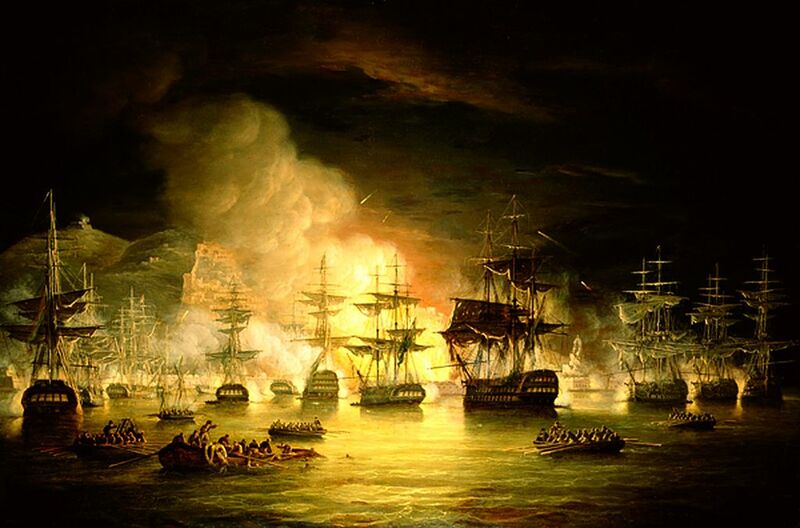 The Battle of the Nile, August 1st 1798, at 10 p.m.
Up to 1800 Luny’s life had not only been dramatic and adventurous, but also triumphant in professional terms. It was now however that great misfortune fell upon him when he was attacked by rheumatoid of arthritis. It deprived him initially of the use of his feet, and later, cruelly for an artist, it closed his hands so firmly that he could not move his fingers. In this state he moved in 1807 to Teignmouth in Devon, apparently to be his friend Captain Tobin, who had also retired there. It was now that Luny’s fortitude and greatness of spirit asserted itself. Despite all his disabilities he continued to paint, receiving numerous commissions from ex-mariners and others, with the same success as before. He was to continue working up to 1835, chair-bound and only able to clutch his brush between hands which could not hold it in his fingers. For delicate manipulation he is said to have held the brush in his mouth. This had no obvious impact on the quality or pace of his artistic work. In fact, of his lifetime oeuvre of over 3,000 works, over 2,200 were produced between his disablement in 1807 and his death. His style is unmistakable. Specimens of Thomas Luny’s work are exhibited at the National Maritime Museum at Greenwich, London, in the Royal Albert Memorial Museum in Exeter, and at The Mariners’ Museum in Newport News, Virginia. If you read this, and if you’re lucky enough to see any of Luny’s work, pay a silent tribute to the memory not only of a great artist, but of a great spirit.